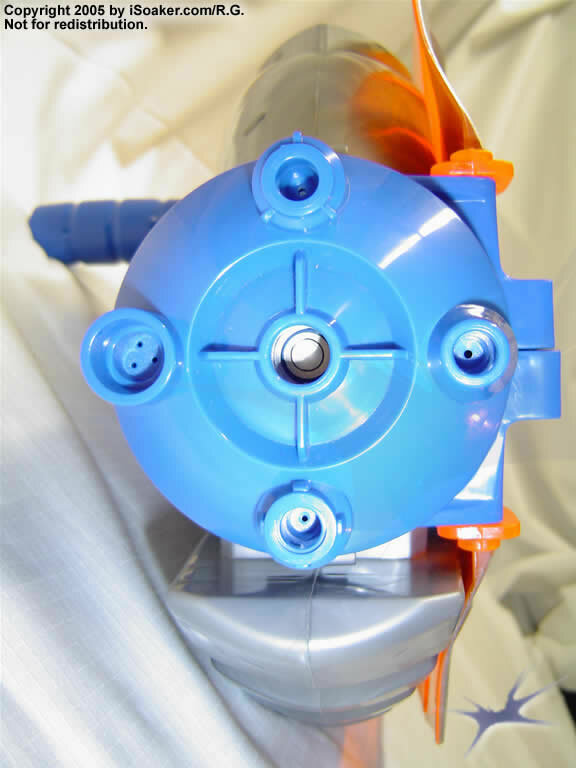 The Shield Blaster 2000 is the mid-sized peristaltic-pump-based water blaster released in 2004 by Mattel Inc. Unlike most other types of water blasters on the market, the Shield Blaster series relies upon a crank-based system to push water from the reservoir and out the nozzle. 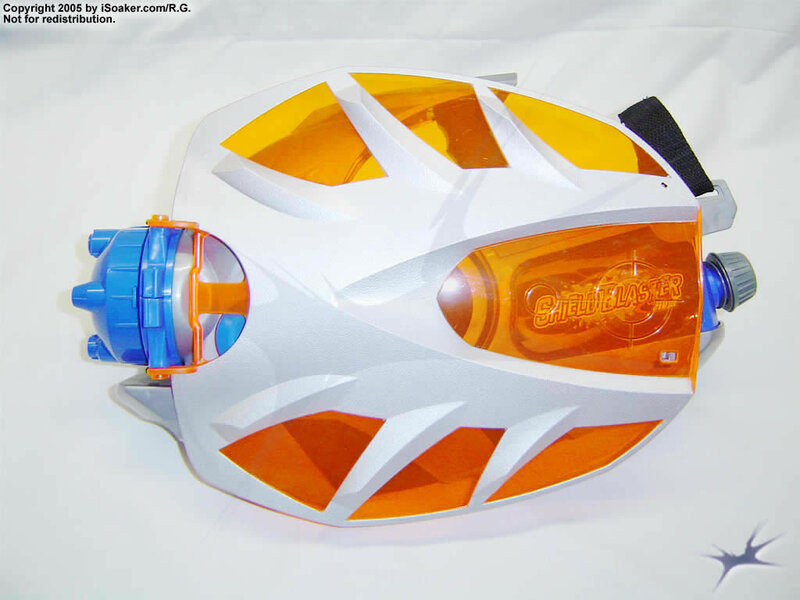 The Shield Blaster 2000 comes in two different colour schemes. Out of the box, one must attach the crank to the body of the blaster prior to use. Afterwards, it's just a matter of filling the reservoir and turning the crank to begin blasting. Designed for being held by one's left hand and cranked using the right, the Shield Blaster 2000 is opposite other blasters which are typically held by one's right hand while pumped using the left. 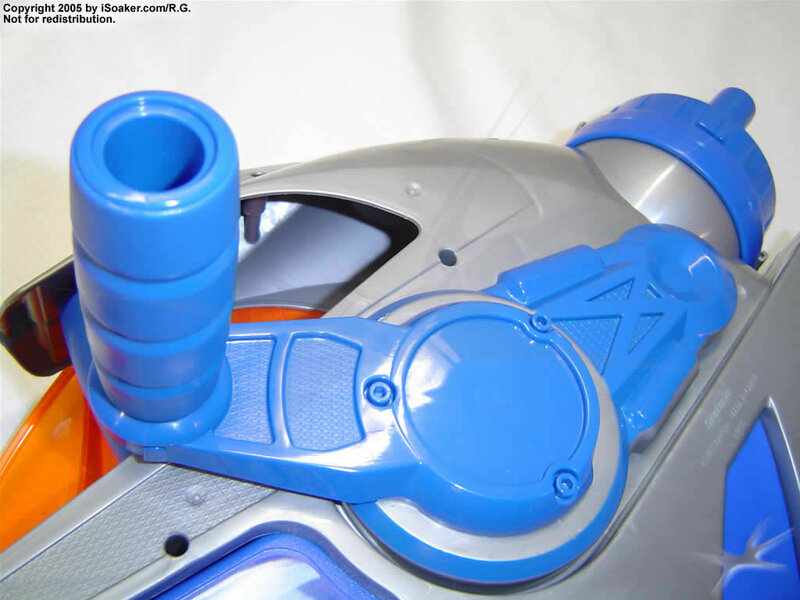 There is also a velcro strap which is meant to help secure the blaster to one's hand/arm. Admittedly, this configuration felt somewhat awkward. Switching hands is not an option. As well, since the blaster is strapped on, it makes it impossible to use additional blasters easily since one would need to release the strap and put the blaster down before one could make use of another blaster. The blaster, itself, features four different stream settings based on which position the nozzle selector is in. There are three different stream thickness settings and one triple-spreading stream setting. Pumping, though not difficult, made it more difficult to keep the stream held steady since one must be turning the crank for water to be flowing. As well, while no pre-pressurization is require in order for the Shield Blaster 2000 to shoot, the size and range of the streams are mediocre at best. One can achieve a slight improvement in range by cranking faster, but this also comes at the price of less control over the direction of the stream. Also, the fact that this blaster does not pressurize also means one always needs to be cranking in order to produce a stream. Its name, however, arises due to the additional shield device that is attached to this blaster. The shield portion can be folded down if not desired or swung out and rotated about the barrel of the soaker in order to offer some protection from incoming streams. Usefulness is actual water battles is there, but the clip used to hold it down when not desired does not hold tightly. Combined with the awkward nature of the pump, it is questionable whether one will be able to make good use of the shield even though it is there. In the end, the Shield Blaster 2000 has some potential, but does not pull through as well as it could have. Crank-based stream production could be useful, but the choice of hand mounts and small pump volumes means awkward pumping motions and overall lower output. While perhaps useful for base defence, it is not recommendable to confront users of soakers larger than an XP310 or Max-D6000. No need to pressurize to shoot a stream of water. Built-in adjustable shield. No strap. Awkward hand placement when pumping. Small nozzle settings and limited water capacity.